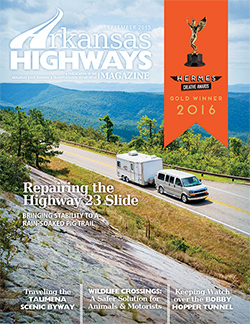 Arkansas Highways is published quarterly for employees of the Arkansas Department of Transportation as a medium of departmental news and other information. It is also distributed free of charge to the public upon request. Correspondence and materials should be directed to: Arkansas Department of Transportation , Public Information Office, P. O. Box 2261 Room 1002, Little Rock, Arkansas 72203-2261.
produced by AHTD from 1924 to 2012.